AFP/Petras MalukasA man puts the finishing touches to a pyramid made of 1,000,935 Lithuanian cents in Vilnius, on November 29, 2014. 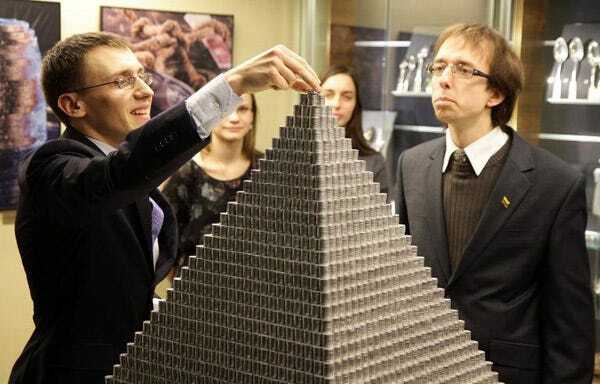 The Baltic nation of Lithuania on Saturday unveiled what it billed as the world’s largest-ever coin pyramid ahead of its switch from the litas currency to the euro on January 1. “We have certainly beaten the world record. Previously, the biggest pyramid of this kind was made up of 600,000 coins”, said 26-year-old volunteer Domas Jokubauskis. All the coins will eventually be donated to a children’s charity. Its neighbours Estonia and Latvia joined the European single currency in 2011 and 2014 respectively, eyeing improved investor confidence. Lithuanians are divided over the currency switch, with 47 per cent supporting it and 49 per cent against it, mainly due to fears of price hikes, according to a Eurobarometer survey in September. The litas helped to consolidate Lithuania’s statehood on the two occasions it restored independence from Moscow, in 1918 and 1990. The new euro coins will still feature the national coat of arms — featuring a knight on horseback with a sword and shield — which has identified the country’s currency since the 14th century.